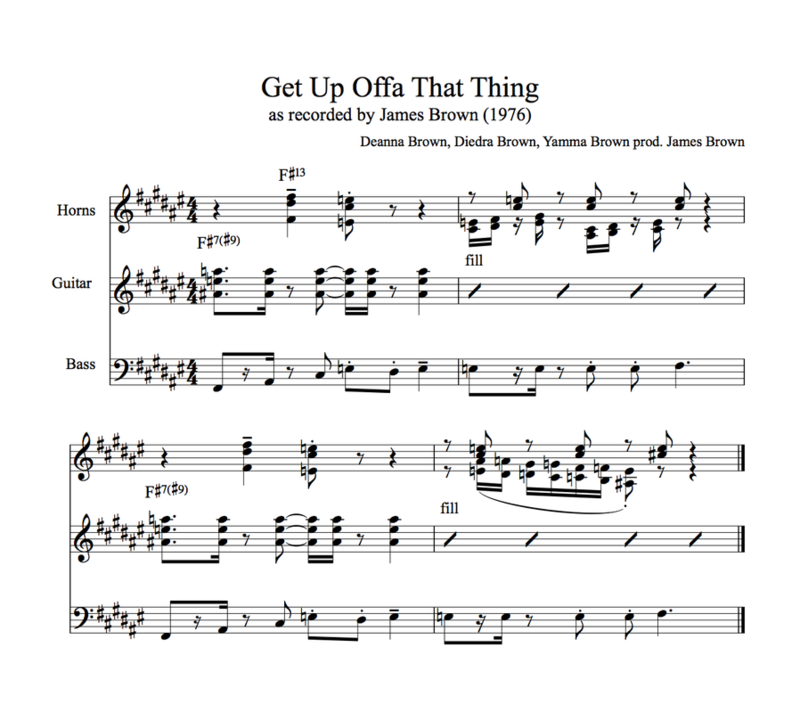 Branford’s point is well taken: an exclusively harmonic understanding of music is a common pitfall of jazz students in particular, and it’s very shallow and one-dimensional. With that said, I think that the harmonic dimension of these grooves is worth digging into! Repetitive vamps may not yield much in terms of functional analysis, but they can be quite rich in harmonic color. As anybody who’s ever tried to write or improvise a compelling funk groove can tell you, the choice of which chord to play and exactly how to play it is both important and delicate. 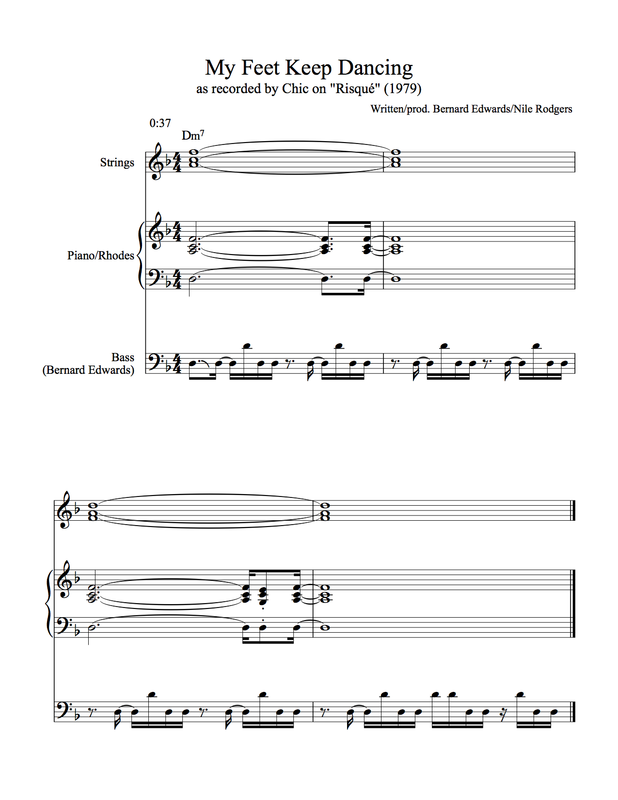 When you’re hearing the same couple of measures for potentially hundreds of times in a row, every detail really stands out, and this invites and inspires note choices that wouldn’t occur under other circumstances. Below I'm going to look at a few personal favorites of mine through a harmonic lens. 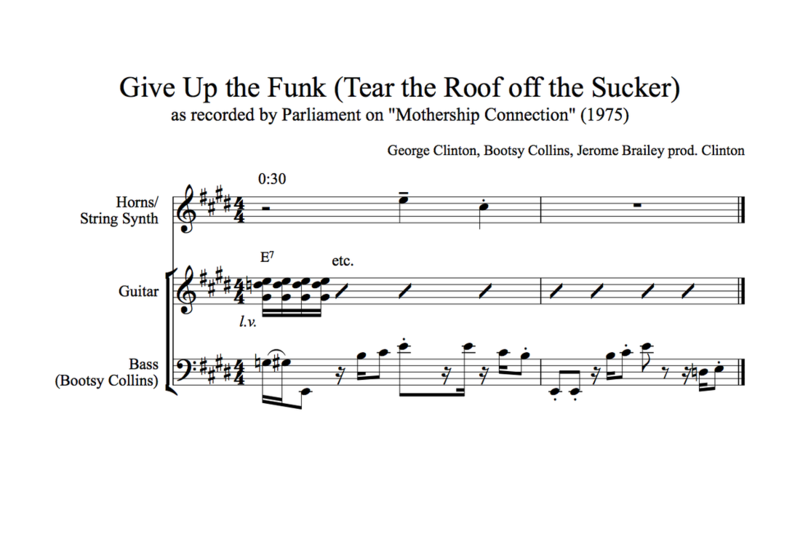 Dominant 7th: "Give Up the Funk" features E minor pentatonic horn lines over the E7 chord, where the G and the A in the horns technically clash with the G# in the chord. This particular “clash,” though, (minor pentatonic over a dominant chord), is as old as the blues and not unusual at all. 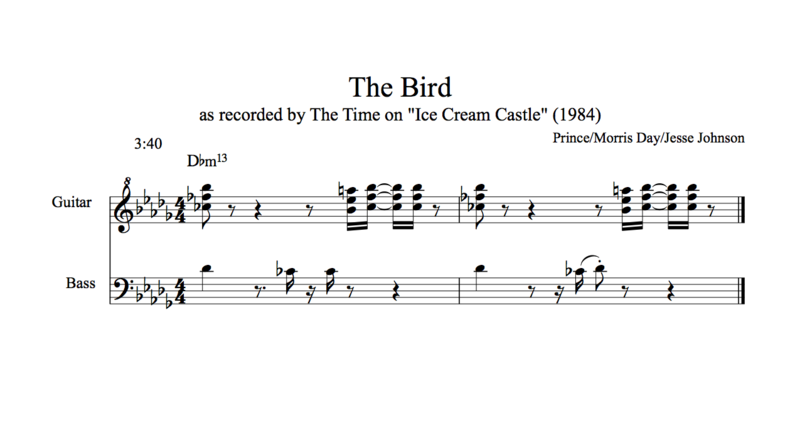 Minor 13: "The Bird,” by Morris Day and the Time, contains an example of a commonly used funk voicing: 7 - m3 - 13. It has a particular charm up high on the guitar. Sometimes interesting harmonic colors arise from the fact that nobody is playing a chord. 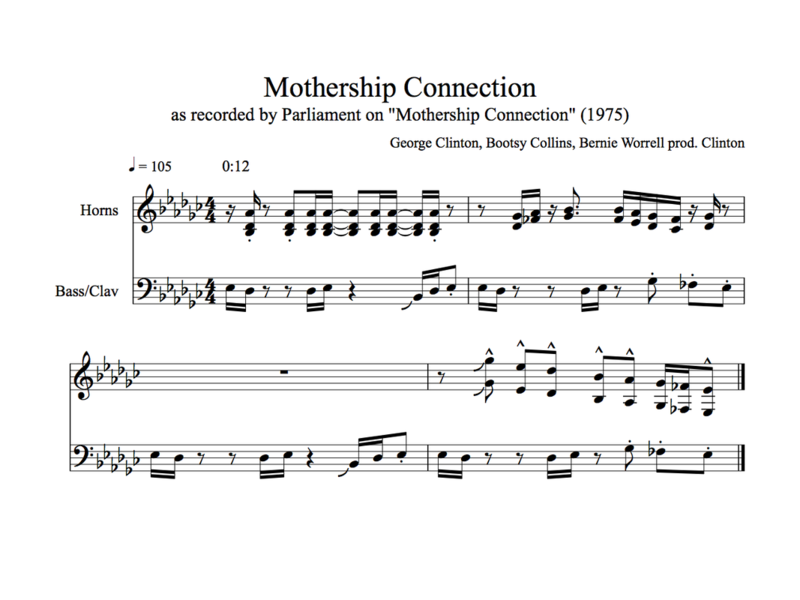 In much of Parliament’s “Mothership Connection,” there's only a riff and a horn line. The riff implies Eb minor pentatonic, but the horn line, which comes and goes freely, oscillates between Eb7sus and Eb Phrygian. The fact that these secondary colors come around nearly randomly creates a sense of ambiguity that would be lost if a particular chord were sustained. When chords do enter in the B section (not pictured), the effect is very cool. When you throw all of these flavors in the pot and start mixing them, you get all sort of interesting colors that wouldn’t normally make sense vertically. We’ll start with different flavors of 9ths. 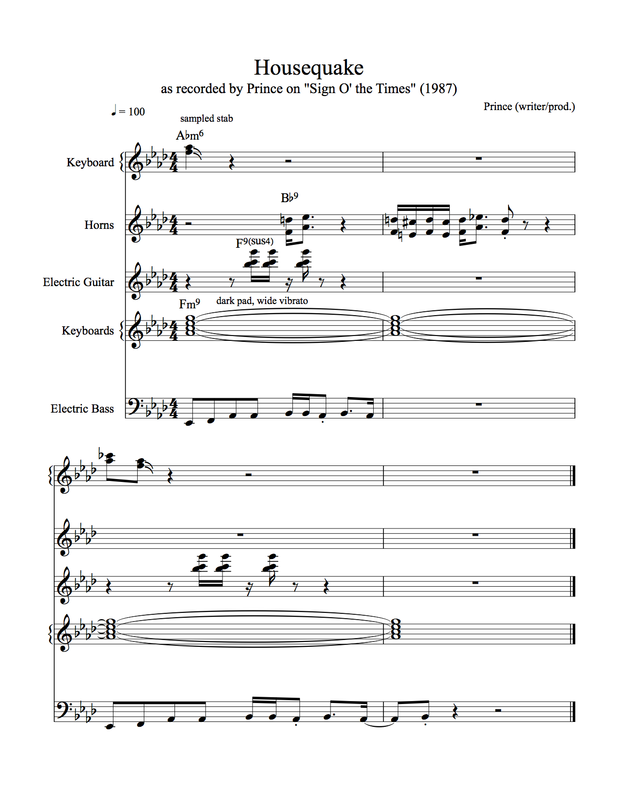 In Earth, Wind, and Fire’s “Africano/Power,” from their live album Gratitude, the guitar chunks away on E13 and E9 chords while the horns stab E7#9 chords. Usually natural 9s and #9s don’t mix, but in this case it works, perhaps because the #9 is perceived less as a 9th and as more as a "blue third." “More Bounce to the Ounce,” a hit from Zapp’s first album, features an extra funky guitar riff that combines a major triad (bluesified by a grace note hammer on) with a quartal minor 11th voicing. 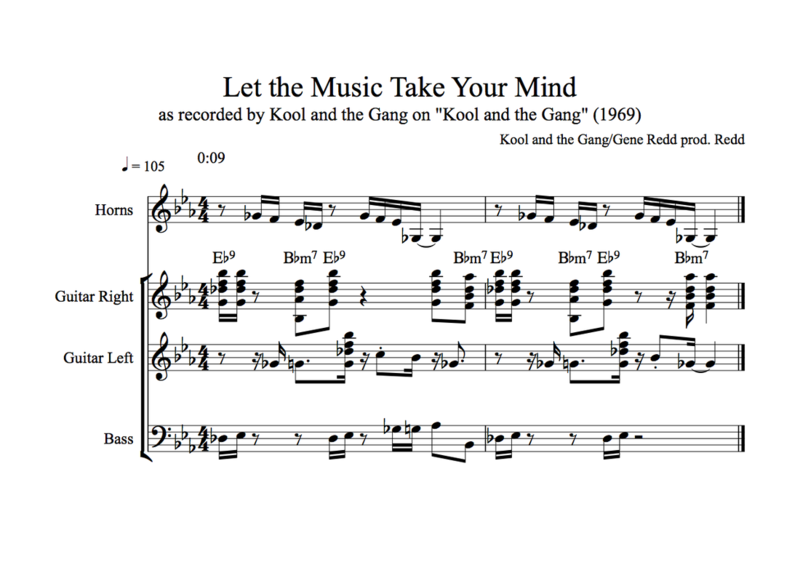 In “Let the Music Take Your Mind,” an early Kool and the Gang track, the right channel guitar part oscillates between a Eb7 with no third and a Bbm7 (which could also be considered an Eb9sus). The left channel guitar part mixes a Eb9 chord with a bluesy 13#9 line. The bassline seems to imply a move to Ab, but none of the chordal instruments follow. The combination of all these colors is quite cool with the parts panned hard left, right, and center. 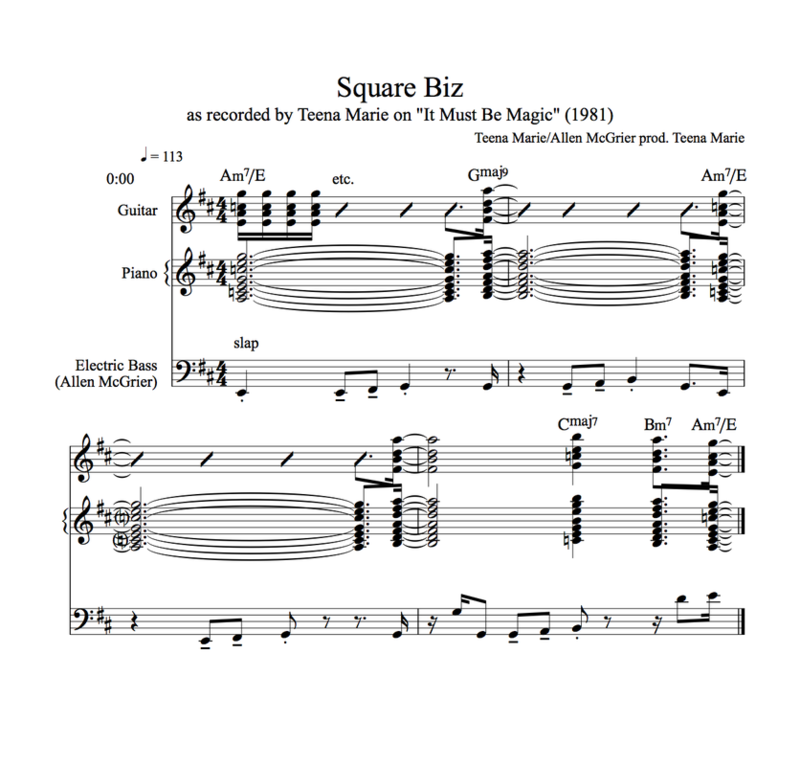 I always assumed Teena Marie’s “Square Biz” was a straightforward Em7 vamp, although something about it always seemed mysteriously colorful. 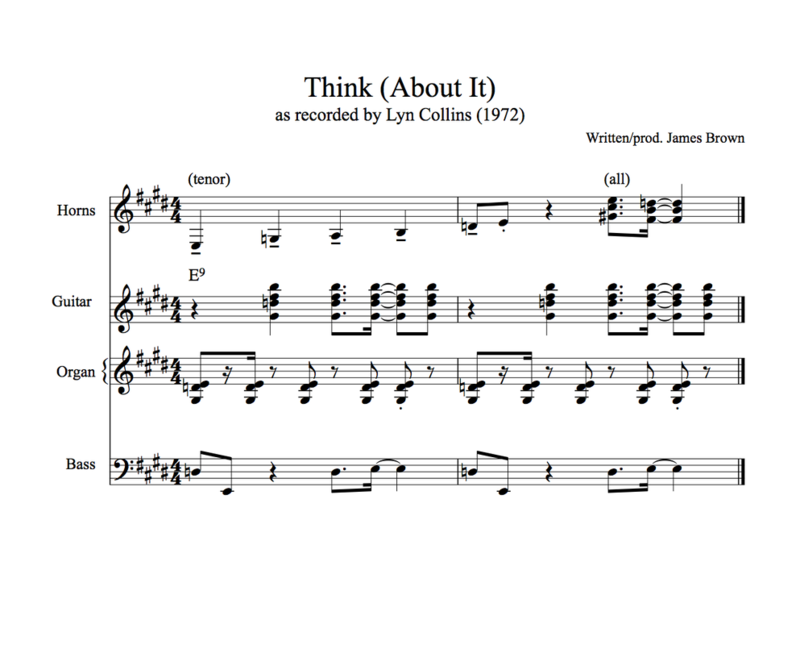 It wasn’t until I had to play it that I realized that, though the melody and bassline imply E minor, the keyboards and guitars hang around an Am7/E, never fully resolving to the ostensible I chord, Em7. 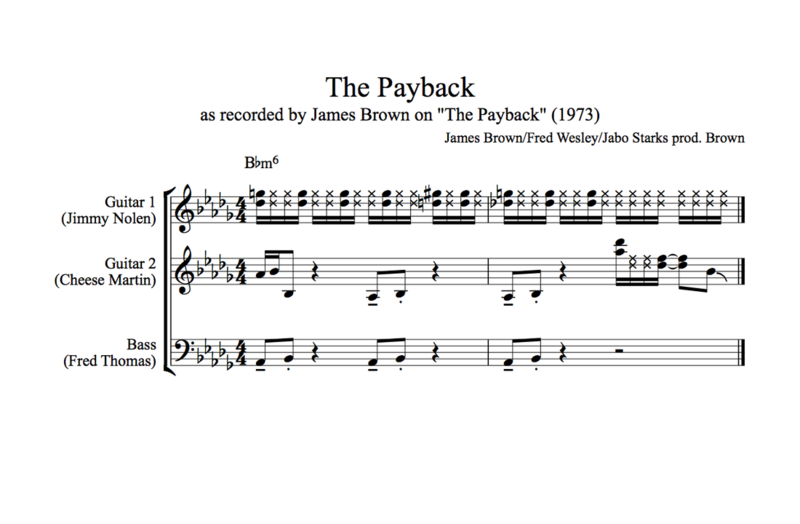 Prince was a master of subtle harmonic tricks. 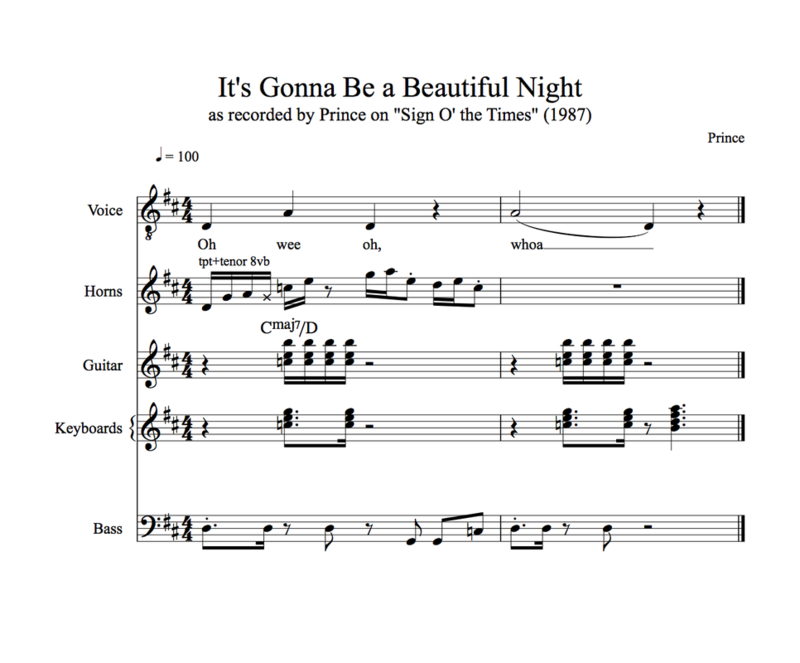 In “Gonna Be a Beautiful Night,” from Sign o’ the Times, the horns start with a line that implies A minor. When the rest of the layers come in, however, we’re actually in a D7sus tonality! The ordering of the layers is important here; if the horns came in after the rhythm section, the effect wouldn’t be as strong. Therefore, to really get the effect, I recommend listening to the whole track. In “Housequake,” from the same album, we have a Fm9 sound, subverted and abstracted in several ways. The bassline surrounds F without ever really settling on it. 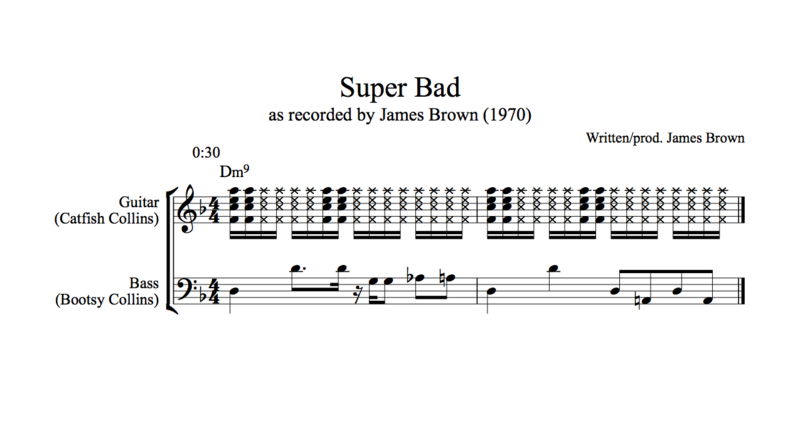 The horn line is a James Brown lick in Bb. 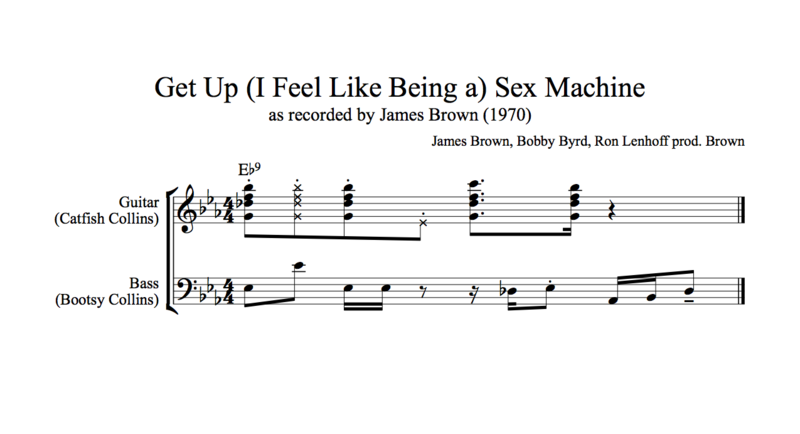 Most oddly, there’s a sampled horn stab on an Abm6 chord. The one synth that actually lays out Fm9 has a wide, otherworldly vibrato that obscures the precise pitches. The classic production team of Jimmy Jam and Terry Lewis, formerly keyboardist and bassist of The Time, was strongly influenced by Prince, among others. As expected, they are also masters of harmonic ambiguity and surprises. 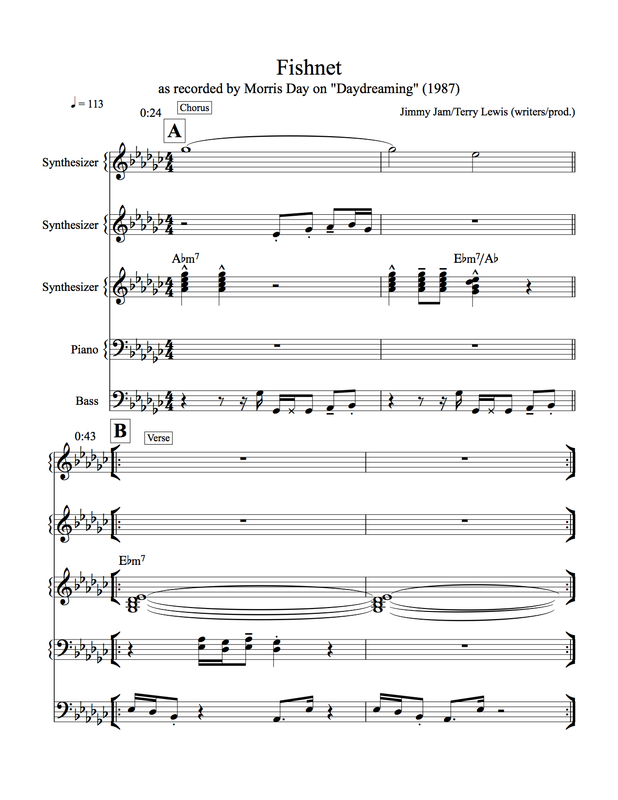 “What Have You Done For Me Lately,” from Janet Jackson’s Control album, is entirely in Eb Dorian, except for two measures in the middle of the second verse that replace a C with a Cb, making the harmony momentarily Eb Aeolian. Unexpected, subtle, and very effective. Once again, listen to the whole track for optimum effect. 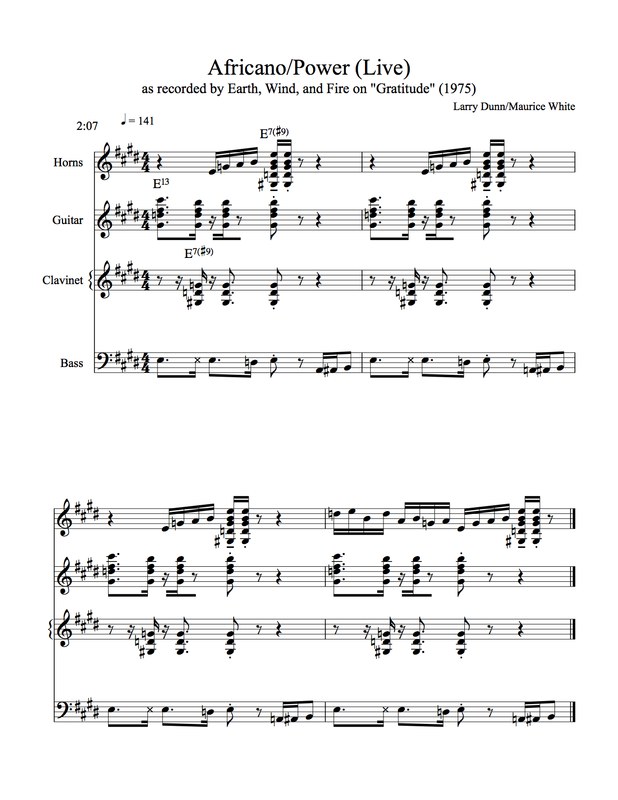 “Fishnet,” another Jam/Lewis production from Morris Day’s second solo record, bounces back and forth between a chorus and a verse/vamp, both in modes of Gb major. 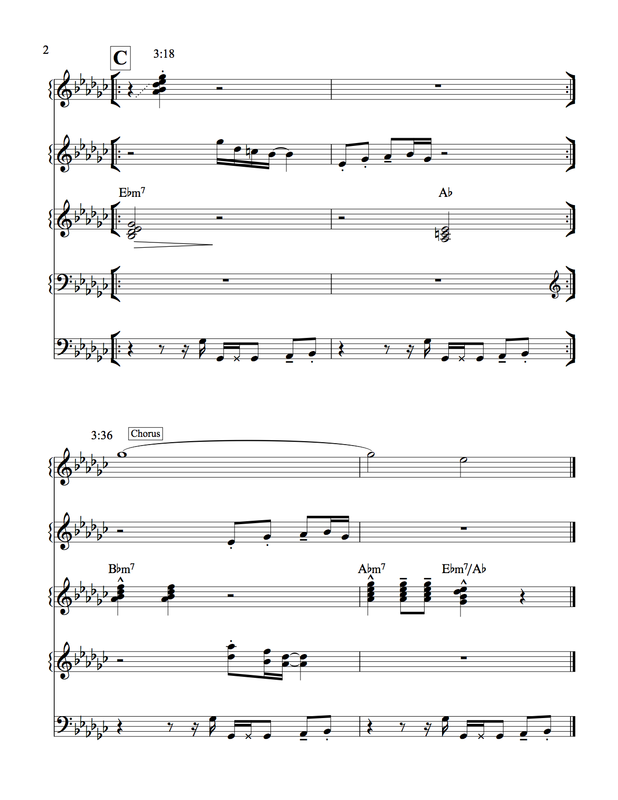 The chorus implies Ab dorian, although the bassline is ambiguous as to the root. The verse is entirely in Eb minor pentatonic, though in the absence of a 6th, we hear an implied Eb aeolian. At 3:17, the entrance of the note C changes the color to Eb dorian, which is a subtly refreshing event. Once again the order and pacing of the sections are crucial, and listening to the entire track is recommended. This track also contains a harmonic surprise: at 3:36, the first chord of the chorus, which has always been Abm7, changes to Bbm7 for a mere two beats. The high synth still holds out Gb like it normally does, but here it is the b6 of the chord, a “blink-and-you-miss-it” clash that is very effective. Hopefully these examples demonstrate that the masters of funk have invented some really unique and interesting harmonic devices, in addition to their rhythmic and formal innovations. Neglecting the harmonic dimension of their music at best diminishes their artistry and at worst contributes to the unfortunate prejudice that funk is less sophisticated or valid than jazz or classical music. Keep it funky out there! Adam Bravo is a Los Angeles based keyboardist, pianist, and educator.